Last week I took the family hiking up Penang Hill (Bukit Bendera). I had been to Penang Hill a couple of times before back in the 1980s and 1990s but I had always used the funicular train and never tried hiking up it before. The highest point of the Hill (known as Western Hill) is 830m above sea level (2731 feet) making it the 239th highest peak in Malaysia (see my list of Malaysia's highest mountains). 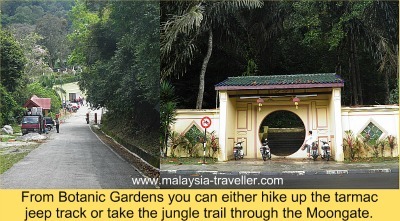 There are various hiking routes, a couple of which start near the entrance to Penang Botanic Gardens. One route is a jungle trail beginning at the Moongate (a circular-shaped entrance on your left hand side as you approach the carpark to the Botanic Gardens). The other route is the 'Jeep track', a tarmac road to the summit which is open only to the cars of residents who live on Penang Hill and other authorised vehicles. I asked the security guard at the entrance to the jeep track which is the best route to take. He said the jeep track is straightforward but steep whereas the jungle trail has a number of forks where it is possible to take the wrong path. As I had my kids with me and no map of the hiking trails I opted for the safer but more boring route, the jeep track. It is quite a steep road in places and fairly tiring. We were passed by a number of motorbikes and 4WD vehicles but saw no other hikers going up (we met a few coming down). 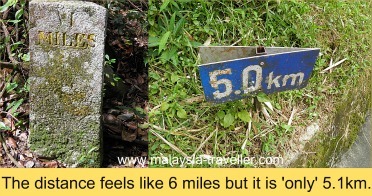 After an hour or so we stopped at a resting place where there was a path signposted toBatu Feringgi which would probably be an interesting route to take. About half way up, next to a tea stall, we saw a sign for Moniot Road which, according to the sign, was one of the earliest bridle paths laid out around 1825. It was here that early botanists in Penang collected many of the hill flora specimens which found their way into herbariums around the world including Penang's own Botanic Gardens which were established in 1884. Eventually, as we neared the peak, we saw the first of the old colonial bungalowswhich were built by the British as getaways to rest and recuperate from the sweltering heat of Georgetown below. The first building bore the inscription Grace Dieu 1927. Finally we reached the main Bukit Bendera area after walking just over 5km. The walk took us about two and a half hours. 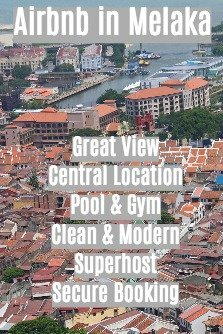 The main attraction of making this trip is the superb view from the top encompassing Georgetown, the Penang Bridge over to the mainland and as far as Gunung Jerai in Kedah. This photo was taken after a heavy rainstorm. Apart from enjoying the panoramic views, fresh air and cooler temperatures there are a few sights to see along the narrow paths that cover the peak area. These include aHindu temple, a mosque, some old colonial bungalows (mostly in private hands but some are available to rent for the night), an old post office and police station, food and souvenir stalls, a mini bird park, Segway rides and so on. Besides the food stalls there is a restaurant called David Browns close to the funicular railway station. 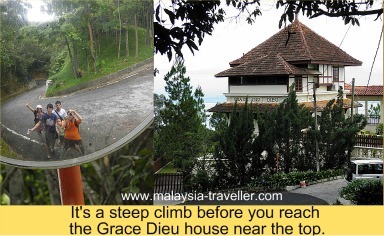 We ate at Bellevue - The Penang Hill Hotel, a 1950s era bungalow which operates as a small hotel. Its pretty outdoor terrace has excellent views and we enjoyed a tasty lunch (we were hungry after our long walk). However it was slightly disconcerting to see a snake curled up on a trellis above our heads. Apparently it is a permanent resident of the hotel and poses no danger to guests but even so we kept one eye on the snake while we ate. The Bellevue is, I believe, the only hotel on the Hill at present. It also runs an annex called The Nature Lodge which offers budget hostel-style accommodation. 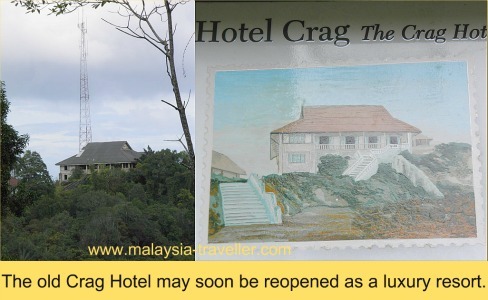 There used to be a Crag Hotel many years ago (before WWII) but the building has been in disuse since 1977 (prior to that it served as the Uplands School for a number of years). There are reports that it has recently been acquired by the Aman Group who run a number of luxury resorts in places like Indonesia, Thailand and Philippines. They plan to restore the building into an upmarket hotel so there will hopefully be more accommodation choices in future. 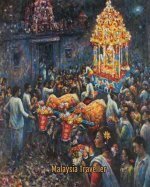 For an interesting article and photos of Crags please take a look at the Capturing Penang website. We chose to do our return journey on the recently reopened Funicular Train. The new version is much faster than its predecessor and we completed the downward journey in less than 10 minutes. The fare was as steep as the gradient. They charged me RM17 per adult and RM15 per child for the one-way 10 minute journey. That's fairly expensive with a family of five. By comparison, the 4WD drivers will charge between RM70 - RM120 for a return trip. 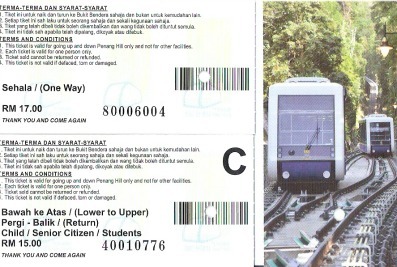 The funicular train station at the foot of Penang Hill is located in Air Itam. From here you will need to take a bus or taxi back to Georgetown or to the Botanic Gardens if you left your car there.